Easter is almost here and can you believe it falls on April Fool's Day? What a strange combo, but Easter is no joking matter as it is the day our Christ Jesus was resurrected. Amen! It touches my heart to remember the true meaning of the holiday and what He gave up for us. I appreciate the fun and novelty of the Easter bunny though and the excitement it brings children. It's pretty funny to think about the bunny though. Why does he bring or hide eggs? Why do we dye Easter eggs when a bunny doesn't lay eggs? I just did a quick search and the Easter bunny originated in 1682 from the German's as a way of "judging" whether the children have behaved well or misbehaved, much like the tradition of Santa Claus. And the eggs came into play because many Orthodox churches would abstain from eggs during Lint, so they would boil the eggs to preserve them to eat to break the fast and sometimes add flowers to the water to dye them spring colors as decoration in their homes. Interesting! Do you ever stop to ponder where these customs come from? Now - on to the fun stuff, and I'll keep this quick. 1) Candy of course! This is essential regardless of the recipient's age. 5) Games: board games, puzzles, etc. Some things to consider that are fun to do is to make a themed Easter basket, especially if making one for an adult. For example, if the person is an athlete then you can make a basket with the theme of their preferred sport. If the person loves chocolate, you can make an all chocolate themed basket. If the person (little girl) loves Barbies, you can make an all Barbie themed basket. This is one way to personalize it each year to what their favorite things are. Do you put together Easter baskets for anyone? What are the things you'd likely put in Easter baskets? I'd love some fresh ideas! 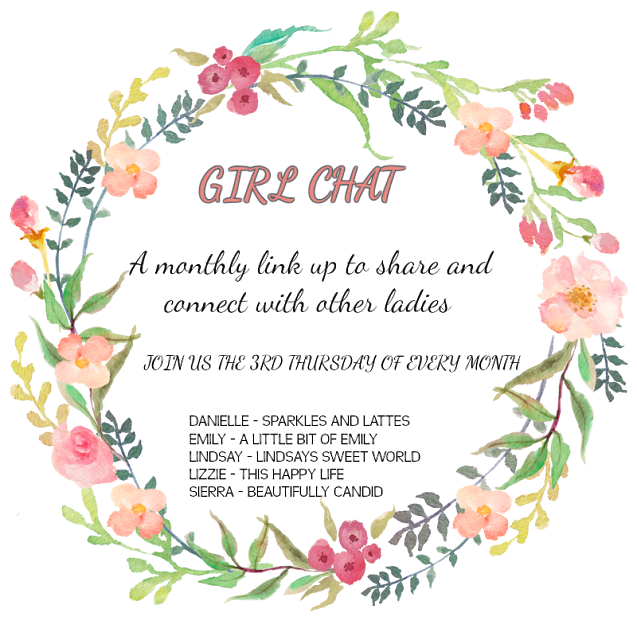 Linking up today for Girl Chat with Emily, Lindsay, Lizzie, Sierra, and Danielle.